Thlaspi septigerum (Bunge) Jafri in Notes Roy.Bot.Gard. Edin. 22:119. 1956. Perennial, 10-15 cm tall, erect, glabrous; rootstock 3-5 mm thick. Basal leaves loosely rosulate, 2.5-3.5 cm long, 0.5-1 cm broad (incl. 1.5-2 cm long petiole), suborbicular, entire. 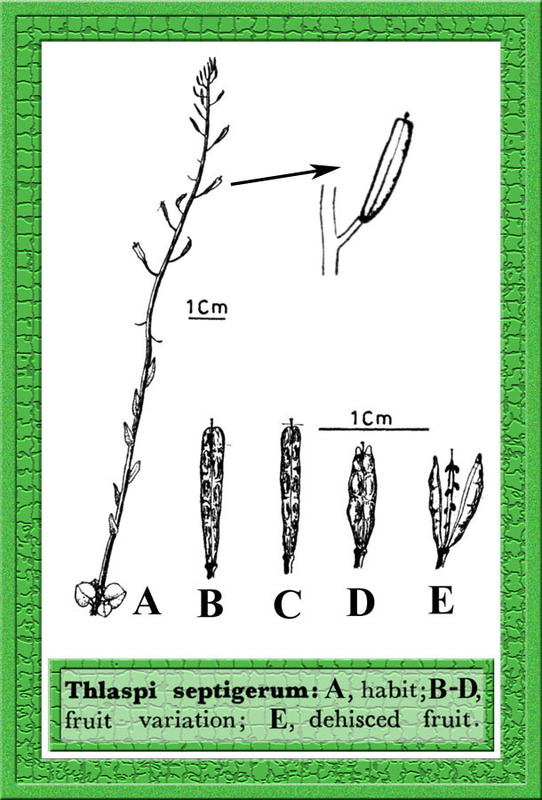 Upper leaves lanceolate or oblong, 10-15 mm long, 3-5 mm broad, sessile, acute, entire. Racemes 10-15-flowered, up to 7 cm long in fruit. Flower's 3-4 mm across, white; pedicel up to 7 mm long in fruit, ascending, glabrous. Sepals c. 2 mm long, 1 mm broad. Petals c. 4 mm long, 1-1.5 mm broad. Stamens c. 2:2.5 mm; anthers c. 0.5 mm. Siliculae 9-12 mm long, c. 1.5 mm broad, oblong, subflattened, apex truncate to slightly emarginate; valves not or obscurely winged at the apex, glabrous; style c. 0.5 mm long; septum c. 1 mm broad; seeds 4-8 in each locule, c.l mm long, 0.5 mm broad, ellipsoid.